These easy, faux-meaty and versatile seitan roulades are made from combining vital wheat gluten with some simple stock to produce a dough which can flattened out, filled with any kind of sweet or savory components and then rolled up and baked. 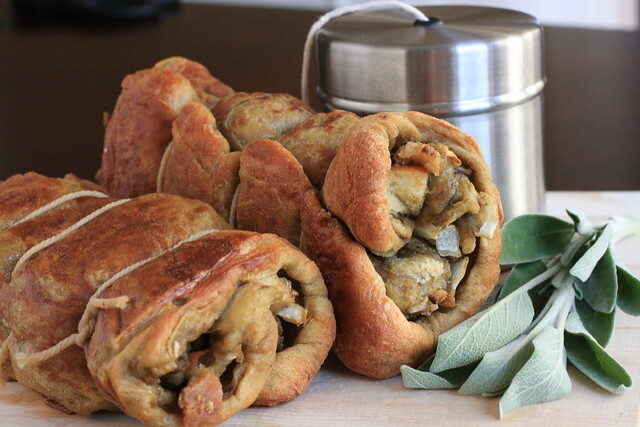 There are literally hundreds of ways to fill a seitan roulade, but my favorite is using a stuffing laced with plenty of rubbed sage, vegetable broth, Earth Balance and sweet onion for a warm and traditional holiday feel. Mix the seitan ingredients in a medium-sized bowl. Add a bit more vegetable broth as needed until the dough is moist and pulls away from the sides of the bowl when mixed. Knead it a few times in your hands and place to the side. Cube the stale bread and place in a large pyrex glass dish. Drizzle the Earth Balance and broth over the top, ensuring that all pieces are well-coated. Toss a few times with your hands. Sprinkle in the onion and sage and toss with your hands again. Sprinkle with salt and pepper. Cover the dish with aluminum foil and place in the oven to bake for about 20 minutes. While your stuffing is baking, flatten out your seitan into a large square shape, getting it as thin as possible. Cut it in half with a knife or pizza cutter. Remove your stuffing from the oven and give it a good stir. Place it back into the oven without the aluminum foil cover and bake for an additional 15-20 minutes. Heat some olive oil in a large skillet over medium-high heat. Place one of the flattened-out seitan pieces onto the skillet to achieve a good sear on only one side, about 5 minutes. Repeat with the other piece and place them to the side to cool. Remove your stuffing from the oven to cool. To assemble the roulades, place one of the seitan pieces seared side down. Spoon a generous amount of the stuffing over the top, pressing it down gently with your fingers. Tightly roll it up and tie off with some baking twine. Brush it all over with a generous amount of olive oil. Place in your 350-degree oven for 25-30 minutes, flipping the roulades over halfway through the cooking time. Rebrush with oil as needed to keep it moist throughout the cooking time. Slice and serve the roulades immediately, smothered in a savory mushroom gravy. these look amazing? what texture does the seitan have? when i don't cut my gluten with another flour i tend to get something pretty gummy, but i've also never dry baked seitan before. Thanks corrinadarling — the texture of the seitan here is a bit chewy, but is rolled very thinly so the texture actually works very well with the soft texture of the stuffing. Hmmm… I could almost smell all the herbs!!! I used to make this when I was vegan. It's also nice to throw a little gravy on it too! Yours looks much prettier than mine, good job! This looks fantastic!! I have been itching to do this with seitan for months! It's too bad I won't have the time to do it for Thanksgiving, we'll be in the airport for half the day. Maybe when we get home.. Thanks Zoa — I'll have to try this next time I make the roulades (for Thanksgiving)and see how it affects the texture … love your blog! amazing.. such a fantastic idea for the holidays! That's gorgeous! I bet your guests are so impressed and salivating at dinnertime. Great idea for the holidays! Just tested this recipe to get the hang of it before Thanksgiving! It's wonderful! Definitely a pain to make the seitan thin… but we started to get the hang of it! Thanks for this wonderful recipe! Anonymous, Thanks for testing out the roulade and for your feedback! I've been making this for either Thanksgiving or Christmas every year for the past three years and really love it too. Have a great Thanksgiving! hey! i'm making this currently, and the 1 cup of wheat gluten to 1 cup of veg broth is very liquidy. is it supposed to be 2 cups wheat gluten? Yes, the ratio of vwg to broth is correct. It should be squishy, but not liquidy – try adding a few tbs more of vital wheat gluten until it is a little more firm. Hi! I would love to make this for Thanksgiving this year, but am not really a fan of traditional stuffing–I know this is a silly question, but do you have any ideas for other things I could put inside the seitan? Thank you! You could always just go with a medley of vegetables, fruit and nuts (walnuts, dried fruit, mushrooms, kale, chickpeas, etc.) — good luck and I hope you enjoy the roulade! Thank you for getting back to me!! Happy Thanksgiving! So I wanted to make the wellington…but I wanted to make the roulade too…so I made the wellington and STUFFED it into the roulade. No phyllo, I wrapped the wellington inside of the seitan. Inside of the wellington, are two whole King Oyster mushrooms…I suppose this is my vegan version of Turducken…? Hope it turns out good–your pics look delicious! Best. Idea. Ever. How did it turn out?!? You should totally make this…I would love to see your version!!!! 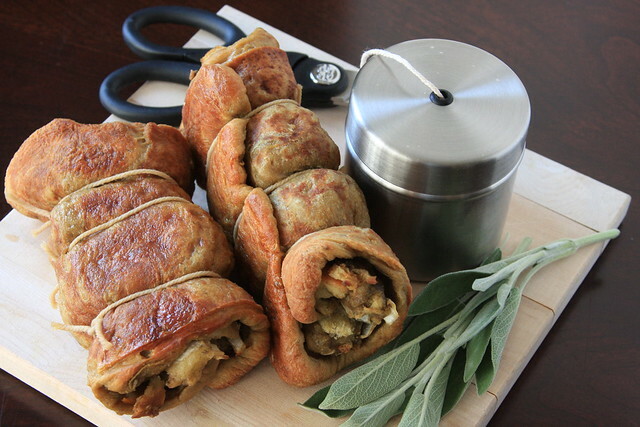 Now I am intrigued … I may have to try this for Christmas too — wheat gluten turducken, I love it! Great! I will keep an eye out for your post! Im going to make the duxelles to stuff in place of the King Oysters…I may wrap the final roast(s) inside of a pretty puff pastry…and serve with gravy…I want something to really impress my parents (Die-hard Southerners who love all things porky and cheesy). Thank YOU, Daphne! I am loving your vegan turduken idea and hope that it goes well with your family! Just made mine today! thanks so much for the recipe my vegan sister and I have been searching for a holiday seitan for years and this is the favourite. It ended up a little thin but still delicious. I didn't see how many your recipe will serve. My family loves seitan and I'm pretty sure I could pull this off for Thanksgiving. Really looking forward to it. I'll let you know how it turns out. Thanks for the great idea! This should serve about 4 — I hope you and your family enjoy it! This is wonderful! I just made it for Christmas dinner; wondering how it will hold-up on a reheat tomorrow? So happy you liked! I've never tried to reheat this, but I think if you brush with some oil and wrap it tightly in foil and lightly steam it, it should reheat fine. I'm truly amazed at this recipe. I've tried making seitan before, mostly steamed, but it has invariably come out rubbery. I'm excited to try this, as I have some vital wheat gluten, and can get some chickpea flour. I'm wondering what is the texture of the seitan like – it can't be like a rubber ball, or your hubby wouldn't like it! so happy you liked, Janina! This is so tasty, I love it! Do you know the calorific value of the roast and stuffing by any chance? I'm counting calories and will need to work it out!! Mandy, so happy you enjoyed! I do not count calories, but I'm sure there is an app somewhere that you can enter the ingredients into to get a calories count … good luck!